After your initial consultation, we might suggest that Cognitive Behavioral Therapy is the best fit for you. If that is the case, here is some information on CBT. 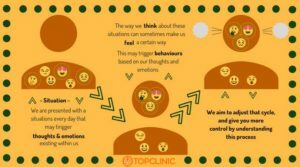 CBT is a form of therapy which focuses on raising our awareness of current behaviours and thinking patterns, and how these form part of a system which effects our experience of emotion in the world. We can change behaviours and thoughts, making it possible to change feelings and experience of life. CBT has emerged as the leading evidence-based practice in psychological therapy in that it can have rapid and measurable clinical change for experiences including low mood, anxiety and addiction. You can schedule an initial consultation for Cognitive Behavioral Therapy by using our booking form.